What does Samsung get with purchase of CSR handset connectivity group? On July 17, CSR plc (Cambridge Silicon Radio) announced their intent to sell their handset connectivity and location development group to Samsung, for US$310 million. The purchase price equates to US$1 million per person, with 310 CSR employees (292 in R&D plus 18 in marketing and support) scheduled to be transferred to Samsung when the deal is closed. In an interview following the announcement, CSR CEO Joep van Beurden said that the employees in the handset development group represent 25% of his company's total R&D staff. 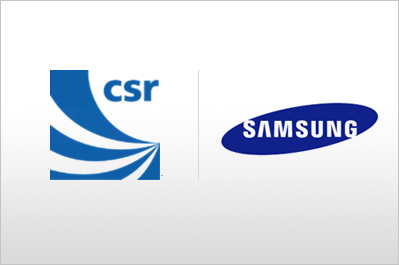 For an additional US $34.4 million, Samsung will be acquire new common shares of CSR equivalent to a 4.9% ownership in the company. The companies expect the deal to close in Q4 of 2012. Special conditions in the acquisition agreement indicate that Samsung's objective is to integrate CSR Bluetooth and GPS IP into their application processors, a capability that the company previously lacked. CSR, which has only developed their designs as standalone components, will be restricted from selling into mobile devices for 4 years. However, CSR is prohibited from integration in a mobile applications processor for 10 years. Parallel restrictions on Samsung eliminate any concern for competition with CSR's ongoing business, prohibiting the Korean company from developing non-handset products for 10 years, or 4 years if combined with an applications processor. CSR will continue to sell its existing chip sets for handset connectivity and location, and will leverage their 2009 merger with San Jose CA based SiRF to further develop devices for indoor location applications. The company will also continue to carry on its legacy in Bluetooth technology by focusing on Bluetooth 4.0 (Bluetooth Smart) for non-handset applications, such as keyboards and personal health monitors. During the investor conference call in which they presented the Samsung deal, CSR's CFO Will Gardiner showed a chart depicting the company's declining revenue from handset products in recent years. Sales have been falling from US$265M in 2009, to US$242M in 2010, then further to US$185M in 2011. CSR has acknowledged some difficulty in migrating to 40nm as their most advanced process node, shipping their first products in 2011. In their 2011 annual report, CSR stated that they have experienced "some delays" in shipping the CSR9800 dual 2.4GHz/5GHz Wi-Fi/Bluetooth connectivity chip. The company began working on 40nm in 2009, announcing a collaboration with TSMC for development of a 40nm LP RF process. At the company's May 24th 2012 Analyst/Investor day, Klaus Buehring - CSR's SVP for Product Development, forecast that revenue from the combo wireless device would begin in 2013. Samsung has a long history as a partner and customer of CSR, going back to their adoption of CSR's BlueCore Bluetooth ICs into handsets in 2005. In 2008 the two companies collaborated on a GPS module, using CSR's software but the SiGe Semiconductor (now Skyworks) SE4120S GPS RFIC. More recently, Samsung licensed CSR's aptX Bluetooth audio codec for integration into the GALAXY Tab 7.0 Plus. Samsung is also using CSR's aptX for Bluetooth stereo audio in the Galaxy S III smartphone. For Samsung, the deal with CSR is described as a "Strategic Partnership". For strategic impact, Samsung's total US$344.4M investment appears to be significantly over-priced when compared to NVIDIA's 2011 acquisition of 4G cellular baseband designer Icera (also based in Cambridge), at a final price of US$352.2M. CSR will retain the exclusive right to sell all of their current products, so Samsung will not see any ROI until they can create new designs of their own. With Samsung manufacturing their latest Exynos quad-core applications processor in the company's own 32nm process, integration of CSR's TSMC-based 40nm designs will involve a difficult migration. CSR has fallen behind competitors in development of WiFi circuitry, currently supporting only IEEE 802.11a/b/g/n, and has made no announcements regarding a move to the latest IEEE 802.11ac standard, which Broadcom and others are already shipping. As part of the CSR deal, Samsung also gains the rights to 21 of CSR's U.S. patents, which they will then license back to CSR on a perpetual, royalty-free basis. CSR claims to possess an IP portfolio of approximately 1400 patents granted worldwide, many of those associated with the company's 2011 acquisition of Zoran (226 U.S. patents), and 2009 merger with SiRF (275 U.S. patents). A search of the U.S. Patent Office database finds that a total of 51 patents have been granted to Cambridge Silicon Radio. Samsung at ISSCC: Quad-core Exynos apps processor relies on skillful analog IC design.